The Altimax Comfort delivers high performance and long service life. A new , asymmetric tread features the unique Replacement Tyre Monitor and Visual Alignment Indicator designed to indicate tyre wear and provide advice for timely replacement. 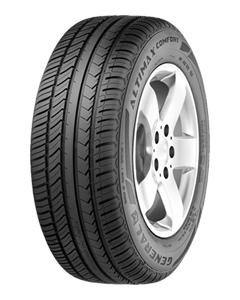 Developed for the climatic conditions in Europe, the Altimax Comfort car tyre ensures a safe grip on wet and dry roads. The non-directional tread also convinces with its durability and great comfort. Above 185 sizes this tyre has two central grooves.